Methane pollution from the oil and gas industry is a serious problem for our climate and communities, but it’s one most people aren’t even aware of. That’s because, while methane is a powerful pollutant, it is colorless, odorless and invisible to the naked eye. But residents of Southern California’s Porter Ranch neighborhood had their eyes opened wide to the methane problem when a natural gas storage well in nearby Aliso Canyon ruptured and created a massive leak right next to their homes – an incident detected by residents in October from the putrid smell of mercaptan, an additive utilities use to more easily detect natural gas leaks. Natural gas is made mostly of methane, and when it is released unburned, it has a warming power over 84 times that of carbon dioxide over 20 years. So, leaking or intentionally emitting unburned natural gas – which happens not just through malfunctions but often during routine production and transportation of oil and gas – can do major climate damage. The California Air Resources Board estimates that Aliso Canyon is pumping out methane at about 50,000 kg per hour, or about 62 million standard cubic feet, per day – that’s the same 20-year greenhouse gas impact as the daily emissions from 7 million cars. 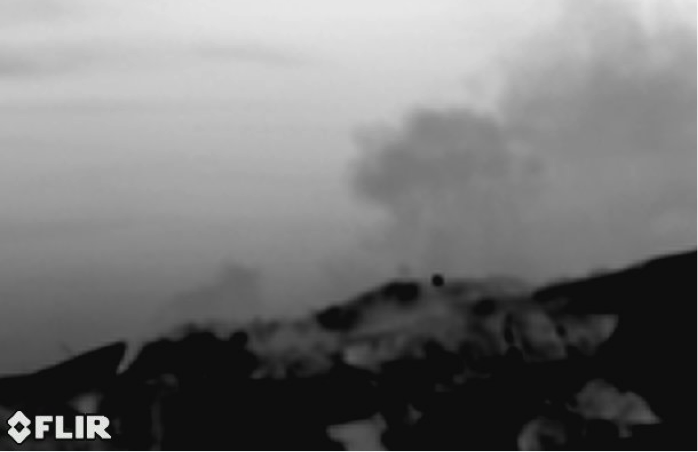 In the infrared photos, taken using both a color display (left) and black and white (right), the methane plume is plainly visible even though it can’t be seen in the naked-eye view (middle). Shot at a distance of about one and a half miles away, these pictures show how the huge, continuous release of methane forms a massive plume that travels nearly straight up until winds push it northward. Infrared cameras are one of the many technologies available today to find invisible leaks of methane from oil and gas equipment so they can be repaired, putting a stop to the pollution. 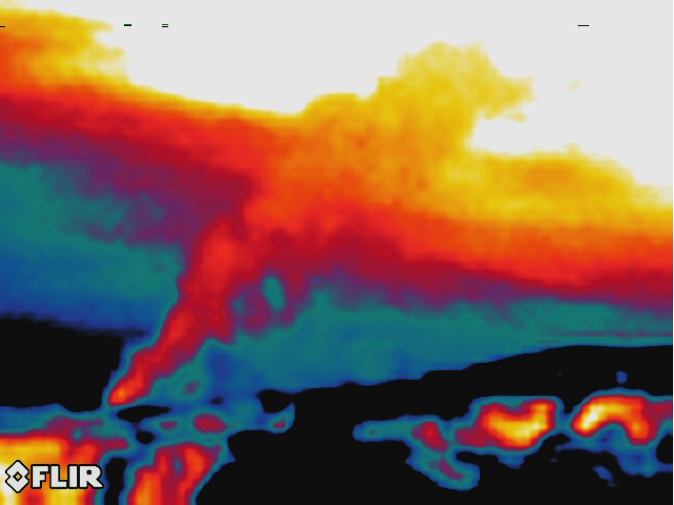 The visuals shown here were taken by EDF using an infrared camera rented from FLIR, a manufacturer of methane mitigation equipment. These images – and video footage shot at the site – substantiate the magnitude of the leak, which is estimated to be over 1,000 feet high and several miles long. Spending only a little time comparing the pictures, one can see the methane clearly standing out from any background clouds and coming from the exact location of the well at the center of the mess. Every day, the Aliso Canyon well is responsible for over a quarter of the state’s daily methane emissions from all sources, and these images show us just what those numbers look like. The mega-leak seen here has not only caused serious health problems for nearby residents, it’s also making a huge climate impact. The Aliso Canyon incident is an example of the type of risks we face as natural gas infrastructure ages, and is a sobering reminder of how important it is to have rules that ensure gas stays in the pipeline — not in our air. The California Gas Disaster: What Comes Next and Where Else Could it Happen? This entry was posted in Aliso Canyon, General, Methane, Natural Gas. Bookmark the permalink. Both comments and trackbacks are currently closed.